With LeBron in LA, Giannis is the new Beast in the East. It’s been a topsy-turvy sort of offseason in the NBA as big-name players like LeBron James, Kawhi Leonard, DeMarcus Cousins and Carmelo Anthony (again) switched teams with the balance of power seemingly shifting even more toward the Western Conference. On the video game side of things, NBA 2k19 looks to remain firmly atop the mountain for video game hoops. Does it succeed? Let’s tip it off and find out. There’s no noticeable change to NBA 2k19‘s layout, continuing on the series’ tradition of heavy stick usage to execute dribble drives, dunks and so forth. It’s a known quantity, the result of years of tweaking and fine tuning, though actual movement is starting to show its age. There’s a floating, skate-like quality to how players move about the court, and the issue of getting stuck in animations that result in turnovers still hasn’t been eliminated. Shooting still feels great, and there’s a tangible difference between shots that flow naturally and ones that are forced. Even if the release is timed correctly, the rhythm leading up to that point has a different feel, making you strive for clean looks. Stringing together dribble moves to break your defender down is as satisfying as ever, too. As for passing, it can be hit or miss, leading to some frustrating turnovers. Some of it gets laid on the A.I, which will sometimes abruptly stop coming to the ball, allowing the defender to cut them off and swipe the ball. Other times it’s the pass, where you’ll inexplicably mix in slow, high-arcing passes when a normal pass would be effective. Lobs could also use an overhaul; we lost count of how many times a would-be dunk off a pick-and-roll went awry for no reason. We’ve enjoyed defending more this year as well. The A.I. does a better job of switching off picks, cutting down on the number of times in a game where you’ll get rubbed off and your assignment will streak to the rim for an easy two. It also feels more doable to plaster your man and shut down their action, though if you keep getting burned expect to have the A.I. run it again. Steal and block animations look cleaner than ever, which is a nice improvement. While many of its contemporaries in the sports gaming world continue to push forward visually, NBA 2k19 seems to be stuck in neutral. Players are still instantly recognizable, of course, and the lighting and colours look great, but it doesn’t look markedly different from the first current-gen releases. Presentation remains impeccable, though, simulating the experience of watching a game on TV as well as any title out there. Dynamic commentary is one of main reasons for that success, and Kevin Harlan once again holds down the fort with smart, well-delivered analysis. Whoever had the idea to have a series of colour commentators and special guests drop in alongside Harlan deserves a raise. It adds variety to a typically static element, and everyone that comes through delivers their lines well. The studio show is an entertaining way to fill time, but can we get Charles Barkley for 2k20? 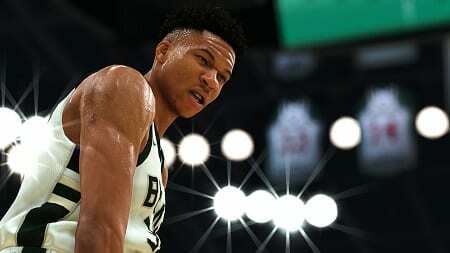 It isn’t a slam dunk — the story arc is heavy on the melodrama and the scripted elements of your character make him kind of unlikable — but there’s some fun moments in the action, like playing old-school NBA 2k and having Chinese language commentary, and you’re free to skip any dialogue you’re not interested in. You can bypass the “Prelude” and head straight to the NBA if you’d like, but we’d recommend playing through it. Either way, once you reach the NBA it’s the usual setup. You play games, upgrade skills and work toward becoming a star. It can be a fun and addictive single-player experience, but it’s worth touching on two things. First, Virtual Currency remains a huge part of the game. It’s not mandatory, and you can eventually move up with enough persistence, but taking your character online can be tough when facing those that used VC to level up. For reference, our review version came with 100,000 VC, and that was only enough to reach the high 70s, which is where players like Patrick Beverly and Thaddeus Young dwell (hardly NBA royalty) — getting from that point to 85 (the land of Jrue Holiday and Kevin Love) will take nearly double the VC. Second, grading feels particularly spotty this year. It penalizes a ton defensively for any kind of mistakes or freelancing (e.g. crashing the boards, double teaming, etc.) and doesn’t reward adequately for offensive play. It’s just counterintuitive that you can almost post a triple-double, go plus-20 and beat a good team yet finish with a B-minus. One nice quality of life upgrade is the neighborhood has been streamlined to a town square where all the activities are easy to find and engage in. Buy boosts, pick up new kicks at Foot Locker, new gear at the NBA Store, jump into pickup games, hit the cages and more. It’s all there and simple to do. For those that prefer a less individualized approach, MyGM and MyLeague are available, both of which offer a deep set of options and goals in relation to running operations. There haven’t been a lot of changes to either one, but they were already among the best franchise modes out there so not much was needed. MyTeam, the card-collecting mode, is also back, but it’s even more heavily steeped in Virtual Currency and failed to strike a chord with us. While not perfect, NBA 2k19 is at its best where it matters most, on the virtual hardwood, putting forth an excellent brand of virtual hoops. This entry was posted on Tuesday, September 25th, 2018 at 3:55 pm	and is filed under BASKETBALL, Herija Green, Video Game Reviews. You can follow any responses to this entry through the RSS 2.0 feed. You can skip to the end and leave a response. Pinging is currently not allowed.